At the annual Ferrari media event in Madonna di Campiglio, it was announced that Pedro de la Rosa has joined the Ferrari team as a test driver. 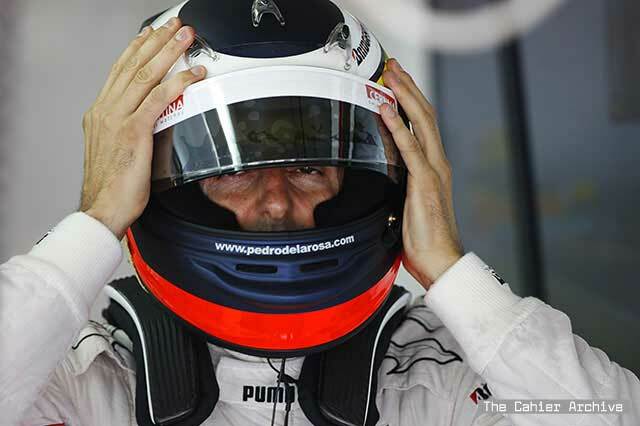 The 41-year-old Spaniard raced for Sauber in 2010, and last season raced for the uncompetitive HRT team. De la Rosa had a contract with the team for 2013, but was left without a ride when the team folded at the end of last season. After debuting in F1 for Arrows in 1999, De la Rosa has spent most of his career with McLaren, acting as a development driver for the British team for eight years, and he is highly regarded for his testing ability. Ferrari team principal Stefano Domenicali said that De la Rosa will focus on working in the simulator, and said, "We think Pedro is the right person to develop this type of activity. We think he is a driver that fits well within our group." "Clearly the fact that Pedro has a good relationship with Fernando Alonso and Felipe Massa is a positive factor, but the decision is purely technical." Ferrari will launch their 2013 chassis at an event in Maranello on February 1st.